Tetris in the snow! For Windows! 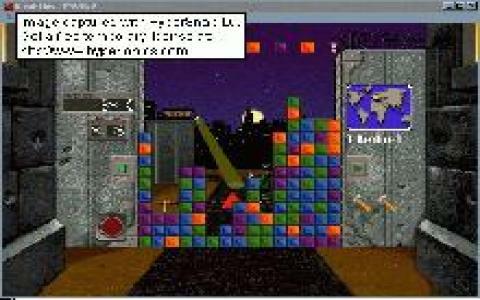 This mid 90s puzzler does little to shed its remix feel, remix of Tetris. While a great and highly playable game, its basic mechanic is that of stacking together the cubes that the game comes with, and so, you will get a pretty cool and relaxing version of the classic tetromino based build. It's definitely not as direct, as the graphics are more colorful, and there are a few additional gameplay elements. For instance, there are some cubes that can explode, and you also get hammers, with which you can delete some of the cubes. Also, another cool thing about the game is that it has different background maps, that will cycle through all sort of different areas of the world, from Russia to China and so on. All in all, though, Breakthru! For Windows plays great, does a great job at keeping you entertained, and if you love puzzles, this is a good and sturdy one, and will make you want to go on a Tetris spree all around. So have it in your collection, it sure is worth it, it's really lots of fun! Breakthru borrows elements from the famous Tetris game and modifies it a bit - you still have falling tiles, but they're not in the shape of the standard tetris tiles and you begin the game with big pile of blocks already piled up, but this time it isn't about the shape of the blocks, its about their color. The game's objective is to eliminate the tiles by clicking on two or more tiles with the same colors, and the main goal being to clear the board from tiles completely. The game starts off very slow, but soon picks up the pace and gets very intense and difficult, because you have to clear the existing tiles before the pile gets to the top of the board, since the tiles from above are still falling. A very simple and extremely addictive game, this is. 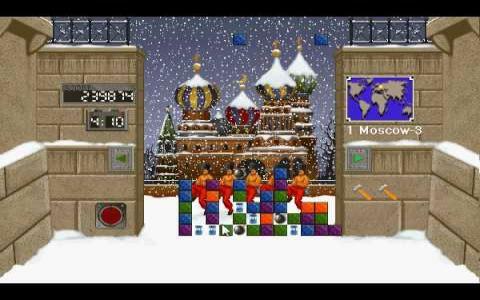 It has great animation and I love the Moscow background and the Russian tune that's playing, reminding me of the original Tetris game from 1987. If you like Tetris and simple, yet fun puzzle games, you should definitely try this game out. Otherwise, go for some other great puzzle games, like Marble Drop or Logical.